Below, a series of French 1:200,000 maps of the Sahara – from Mauritania to the western frontier of Chad. Though the maps date from the 1950s it’s very unlikely that Google Earth would reveal any more detail today. A couple of sheets from the central Mauritanian plateau and an eastern Algerian erg are included to show the mapmakers weren’t just being lazy – there really was nothing to show. Each map covers one ‘square degree’ of the Earth’s surface, which in Saharan latitudes adds up to over 12,000 km2. 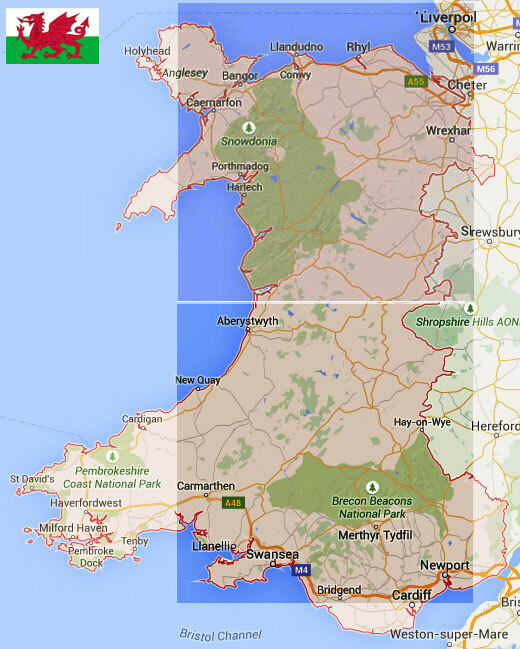 Just two of these maps would cover Wales (right). This entry was posted in Desert Babbles (blog), Maps and tagged el djouf, Grein, majabat al koubra, mapping the sahara, Maps of the Sahara, sahara ign maps, sahara map, tenere on June 26, 2015 by Chris S.